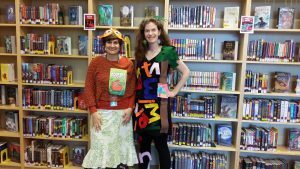 Happy ES Halloween from the Library! We have a Zombie Goldfish and a Chicka Chicka Boom Boom costume to celebrate the holiday! This entry was posted in Uncategorized by Kelsey Hedrick. Bookmark the permalink.